The Foxtail Pool offers a retro vibe, with its own sound and lighting system. One of Las Vegas’ legendary Rat Pack hotels is creating its own legend, following a complete transformation and rebranding. The former Sahara Hotel & Casino reopened as the SLS Las Vegas Hotel & Casino two years ago with a new Philippe Starck design and several guestrooms and suites designed by rock musician/actor Lenny Kravitz. The property, a member of Starwood Hotels & Resorts’ Tribute Portfolio, also offers several dining and entertainment options that are outposts of popular Los Angeles venues. The property’s 289-room Lux Tower underwent a metamorphosis when it added a new W Las Vegas that opened late last year. The hotel-within-a-hotel has a dedicated entrance, lobby, meeting space, pool, and spa and fitness center. Accommodations: Each of the SLS Las Vegas’ two other towers has its own personality, which shows in its guestroom design, although all are contemporary with a dose of whimsy. Standard rooms in the 1,121-room World Tower measure 360 square feet, with views through large windows in place of headboards. The mostly white rooms have full-length backlit mirrors, large work desks and seating areas. Bathrooms feature infinity sinks and all-glass stall showers. With an industrial loft design, the 203 accommodations in the Story Tower feature “floating” beds in the middle of the rooms. The 325-square-foot standard rooms have neutral tones with bright yellow accents. Available only to guests age 21 and older, the rooms also feature wet bar/vanity areas. At 3,300 square feet, the Lenny Kravitz-designed Story Penthouse features graphically patterned furniture and reflections that create the illusion of floating beds and sofas. The spaces, which include a grand dining room, a living room, and two rooftop decks, are adorned with accents like acrylic chandeliers, a lacquer bar, glossy blue tables, a marble fire pit and a red lacquer pool table. This suite is one of several that are normally held for special casino guests but can be booked on a case-by-case basis by calling the hotel. What’s Included: A $30 daily resort fee includes in-room Wi-Fi access, local and toll-free phone calls, pool and fitness center access, concierge services, and valet and self-parking. For Story Tower guests, a minibar stocked with beverages and snacks is included in the room rates. Story Tower guests also have VIP access to the Foxtail Nightclub and Day Club. Best Entertainment: The Foundry features live concerts by an eclectic line-up of artists, including Kansas (classic rock) and Boyce Avenue (contemporary, soft pop/rock). At 20,000 square feet, it has 60-foot ceilings, full-motion graphic production capabilities, a dance floor and five large LED screens. The much smaller Sayers Club has a homier yet edgy feel, with industrial finishes, tufted leather sofas and a patio. It hosts after-parties for The Foundry concerts, as well as its own live entertainment. The Foxtail Nightclub, which opens onto the Foxtail Pool, operates as a Day Club on weekends. A smaller, rooftop pool offers a quieter environment. For gamblers, there’s the 60,000-square-foot Bazaar Casino. What’s for Dinner: Bazaar Meat by José Andrés, a James Beard Award-winning chef, is one of seven food-and- beverage venues at the hotel. With a focus on red meat and seafood, it offers playful dishes like cotton candy foie gras. Other upscale dining experiences include Master Sushi Chef Katsuya Uechi’s Katsuya Japanese restaurant and Cleo, offering shared plates of contemporary Mediterranean cuisine by Chef Danny Elmaleh. Umami Burger, Beer Garden & Sports Book serves up gourmet burgers, salads and craft beers, among other dishes. Guests can design their own pies at 800 Degrees Neapolitan Pizzeria. Upscale comfort food is on the menu at the Northside Café, a 24/7 diner. And The Perq offers specialty gourmet coffee and tea, as well as grab-and-go fare. Bars and Lounges: Besides full bars in the concert venues, pool areas, nightclub and most of its restaurants, the hotel offers the Monkey Bar in the lobby, with portraits of well-dressed monkeys adorning the walls. The Center Bar in the casino serves handcrafted specialty cocktails and shots under an LED fixture with continually playing graphics. Spa and Fitness: With billowing white curtains covering the walls, Ciel Spa and Salon feels like heaven. Guests can indulge in treatments like aromatherapy massages and hydrating body wraps in any of 10 treatment rooms, including a couple’s suite. The adjoining fitness center features cardio machines with personal TV monitors, as well as weight-training equipment. Who Books this Resort: The typical and target clientele are adults ages 25 to 40.
Insider Booking Tip: While Story Tower rooms offer a few more amenities, standard World Tower rooms are more spacious. 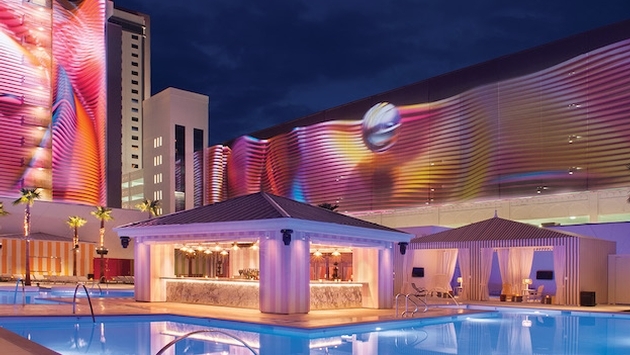 Key Selling Points: Live entertainment – the SLS Las Vegas has it in spades. In addition, it is located across the street from the Las Vegas Festival Grounds, which hosts outdoor mega concerts. Another selling point is the variety of dining options by top chefs. 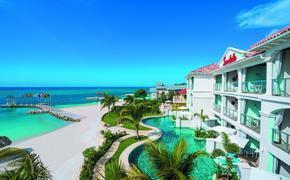 Rates: The current average nightly rate is $79, plus a $30 resort fee. A version of this article appears in print in the January 2017 issue of Vacation Agent Magazine.